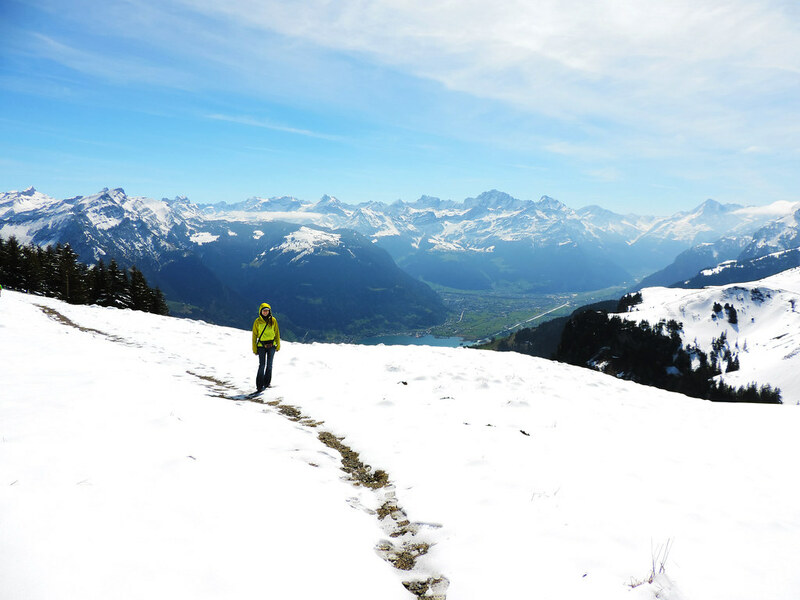 Hiking in the Swiss Alps in April is magical, because there’s still a lot of snow. 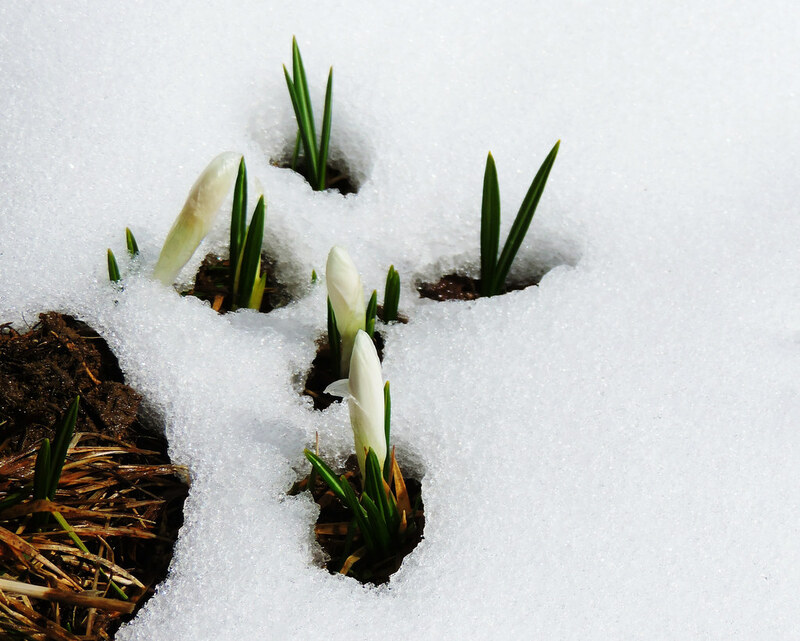 It’s challenging, because there’s still a lot of snow. It’s fun, because there’s still a lot of snow. 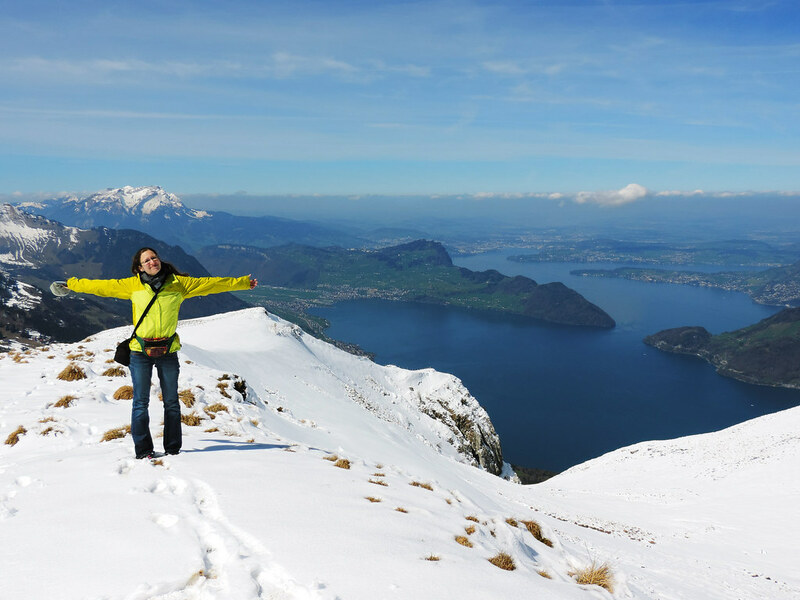 Okay, we haven’t seen much snow since almost 2 years and that is one reason for our enthusiasm about hiking in the snowy Swiss Alps. 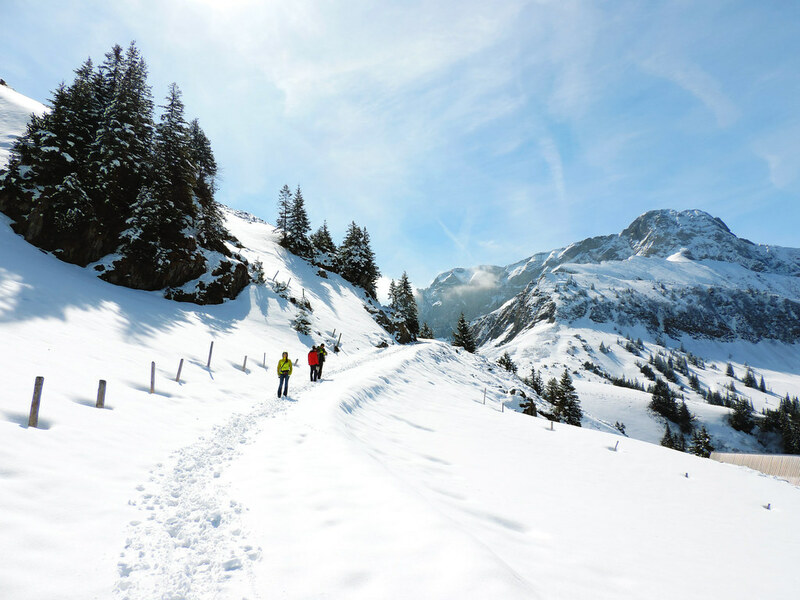 The other is that hiking in deep snow was a completely new experience for us. I was just running around with my camera for some time repeating ’Oh, wow, these lakes are wonderful!’ and ’Oh, gosh, all these snowcapped peaks around…!’. And I was right. 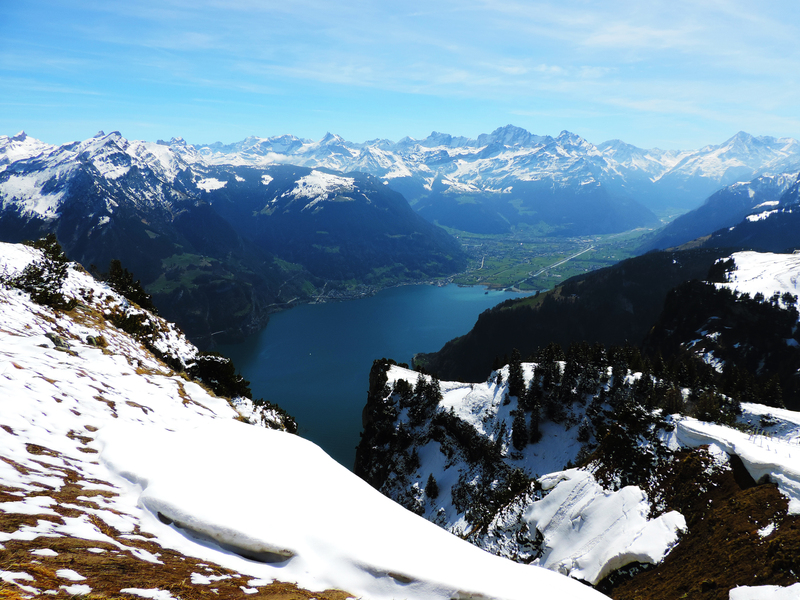 🙂 The panorama of Lake Lucerne with its many blue inlets and the tons of surrounding high peaks deeply covered with snow was really stunning! And we were just about to start our hike which went through a real winter wonderland. Snow covered the peaks, the pine trees and most part of the trail as well. We hiked in ankle-deep snow, sometimes in knee-deep snow and sometimes in the mud where the snow has already melted. The real challenge was that the trail was steep and slippery at some sections. Well, I’m not even sure we followed the trail all the way, because it was buried in the snow, we usually only assumed where it should be. But we followed the yellow sign posts (and I didn’t really care which direction we go anyway, because everything up there was enthralling!). First we headed to Hunds-Chopf and from there to Niederbauen Chulm. All the way we were rewarded with the view of all the surrounding high peaks and the view of several lakes below. How did we like hiking in snow? Luckily, it’s fun to slip in the snow, because you will (not so much fun in the mud). Physically it’s definitely more tiring to hike in deep snow, but you know, there’s always a price to pay and for us it was definitely worth the effort. Snowy hikes have other strange benefits, too. Like you can melt some water from the snow if you are stupid enough not to bring enough water (no, I haven’t heard of anyone doing this, it has just randomly came into my mind). Another thing we were afraid of was the cold. We don’t tolerate it too well. Though everything up there was mostly covered with snow, the weather was sunny and we felt surprisingly warm. We were dressed in layers and we didn’t even need our wind jacket for most of the hike. As for equipments? We didn’t have anything special other than what we would use on any mountain hike: multiple layers, waterproof hiking boots, waterproof wind jackets, sunscreen. It was enough for this short and easy hike in sunny April weather. Hiking sticks may help in the snow. 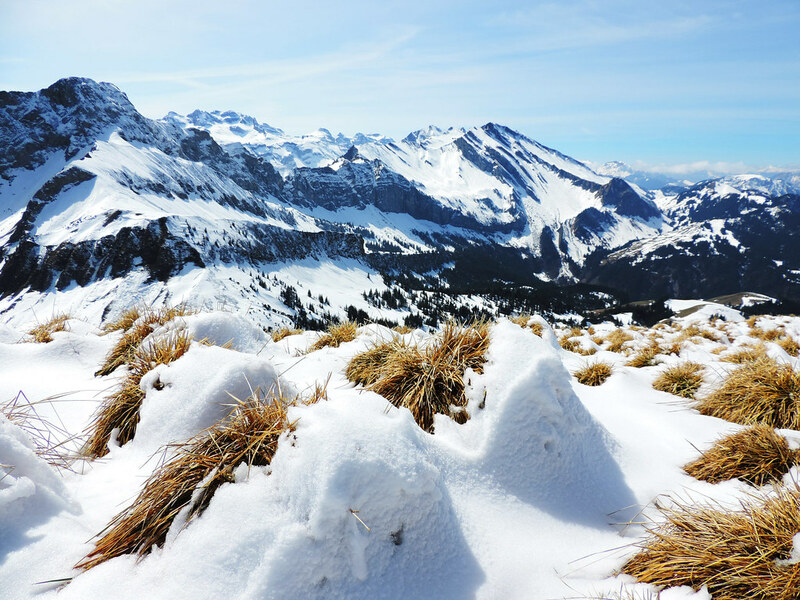 Have you ever hiked in snow? Would you love to do it? Your pictures are gorgeous! I’ve never hiked in snow, seems like it would be an interesting new experience. Thanks Mel! It was so much fun for us! 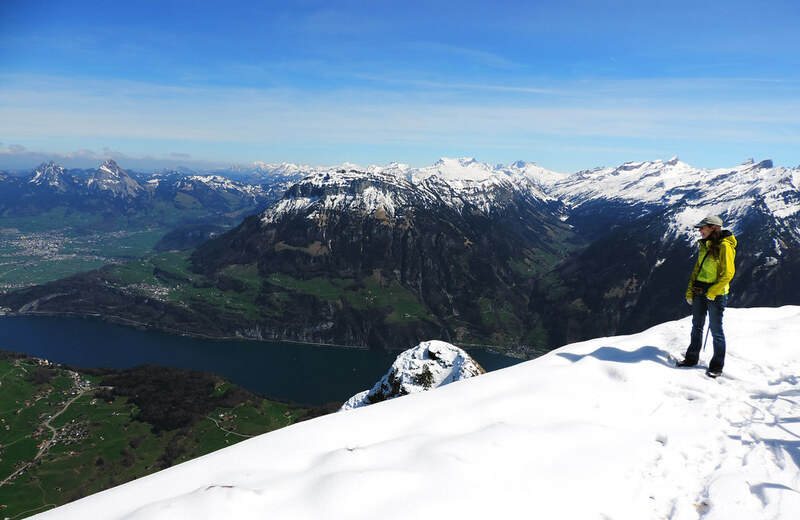 🙂 Also we think April/May is such a great time for snowy hikes, because snow is still there at higher elevations, but the weather is mild and hopefully sunny, too. 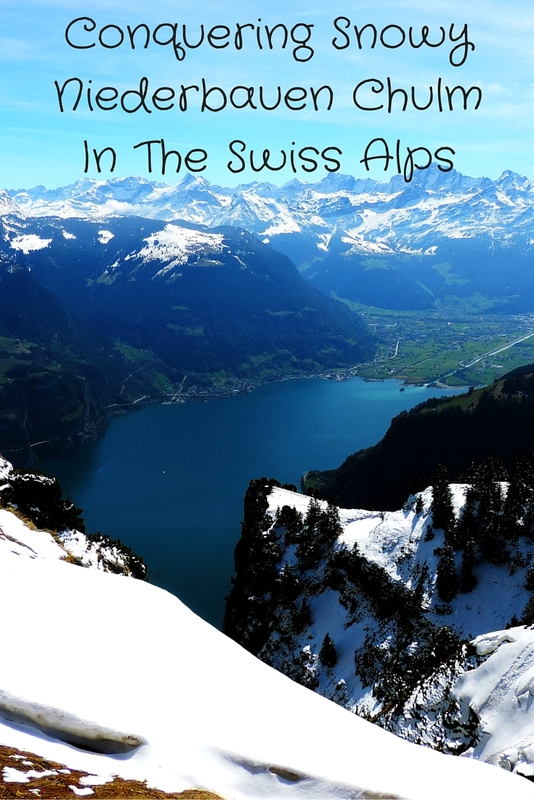 I have not been to Switzerland yet, but plan to go so we can experience the snow. Living in South Africa, we never see snow and it has developed into a mild obsession for me . Your photos make me wish I was there now, thanks for sharing, I just love your hiking posts.